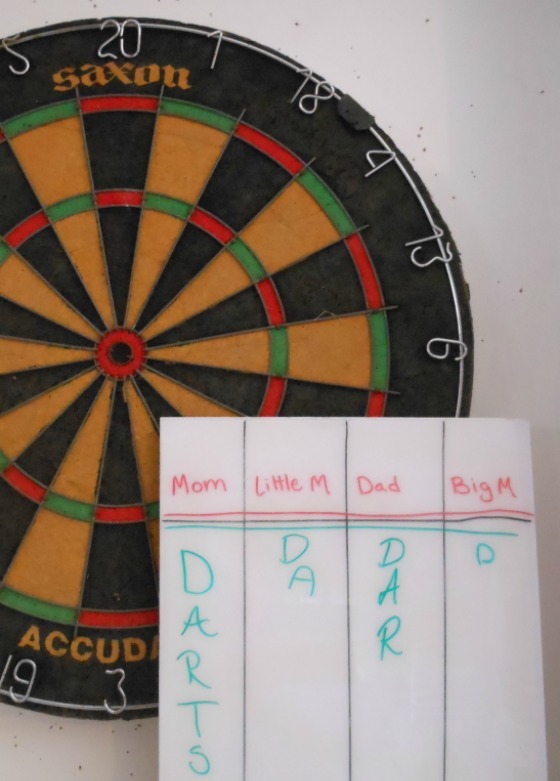 A couple of months ago hubby dug out the old dartboard from the back of the garage and made a pretty little dart cabinet for it… complete with a dry erase score board. Would you be surprised that I am the one most excited about our new dart area? Darts was one of my favorite things to play as a young adult. As life progressed, moving babies made throwing sharp objects around a bad idea. So the dartboard came down and I fell in love with more family friendly games. Well Big M is 9, Little M is 8 and we are free to resume our love of playing darts! The kids want to play too, of course. Who could blame them, playing darts is AWESOME! I will mention that safety is always a factor. We are teaching them how to be responsible with the darts and how to shoot carefully. Also, this post contains affiliate links. Anything purchased using these links helps support amomwithalessonplan.com. Thanks! Big M played a big part in creating this game (bravo little buddy!) and took a lot of pride in our excitement. The game plays out much like the game HORSE for basketball. You’ll need a dartboard and some darts . You may want a dartboard cabinet . On a score board (dry erase board or piece of paper) write out the players names. The first player throws one dart and sets the number for the round. Each player follows, trying to hit that number. If they do not hit it, they write a D under their name. The first player tries to hit the number again. If they hit it, play moves on. If they don’t hit it they get a D as well. The second player takes a turn throwing one dart and sets the number for that round. Each player follows, trying to hit that number. If they do not hit it, they write a D under their name. If they already have a D, they write an A under the D. Once all the other players have had their turn the player who set the number for the round tries to hit it again. The goal is to avoid being the first person to spell DARTS. When someone does spell DARTS they are out of the game. The winner is the person left after all other players have been eliminated. Even the playing field a bit by varying the amount of tries to hit the set number. It should feel like anyone has a chance to win. For example: give the kids three darts while the adults only use one. This advantage would go to less experienced adults also and can be adjusted as skill increases. Make a closer throw line of kids. Don’t count doubles or triples. The set dart only calls the number not the placement on the number (use doubles and triples if everyone is experience dart players). 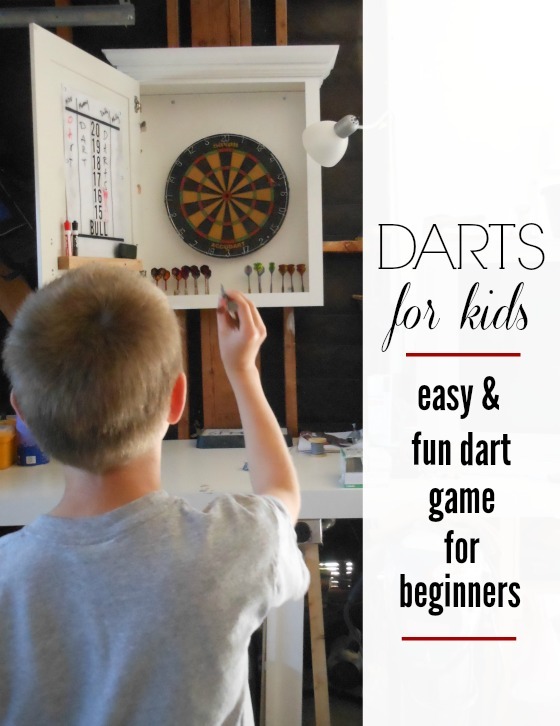 Get a printable version of these Darts Rules. I should add that I used a fake score for the picture. I am the champion of DARTS and usually in the lead. Hee hee. Now I am very curious… did we really make up this game or have you played a version of it before? It’s really a great help to keep kids busy this summer.Thanks a lot .